When you’ve been playing role playing games for a long time, it becomes easy to forget how daunting a game is when you first play it. Whenever a new player joins your table, odds are they’re feeling a little lost. Their character sheet is an overwhelming collection of terms, boxes and numbers, their dice are all shaped nicely but they can’t tell which from which, and you, as the GM, are asking them to do something that is essentially a foreign language. 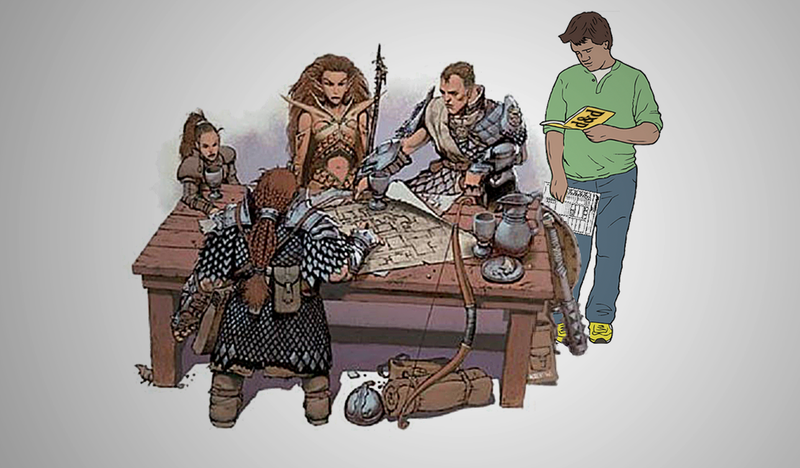 Here are six tips for helping new players integrate into your next role playing game. In games like Pathfinder and Dungeons and Dragons, new players drawn to spellcasters are usually overwhelmed by their spells. They look at the lists of spells and choose a few that sound good, but then when it comes time to use them they forget what they do and don’t look them up. Taking their spells off of their character sheet and instead putting them on cue cards will be beneficial in reminding the players what the spells do. On the card, list information that is relevant to the player: the name, the spell level, the range, duration, and effect. Also listing the ‘style’ of the spell can be helpful to the players. For example; fireball would be a ‘combat’ spell and dimensional door would be a ‘utility’ spell. That of course doesn’t mean those spells are only used in those situations, but it helps remind the player what they could use when. Having a spellcaster feel lost and useless in combat is the fastest way to make them not want to play again. Spell cards grant confidence and comprehension that a character sheet cannot. Resource cubes can be used to denote anything that has a limited number of uses. For example; the number of spells per day, per level, that a sorcerer can cast. In the game I’m running, I have colour coded each level of spell for my sorcerer and witch characters and gave them a corresponding number of coloured cubes equal to the amount of each level they can cast each day. This way when they want to cast a spell they have a tactile feeling of handing a cube over to me, literally depleting their resources. Using resource cubes allows players to understand their skills and that they have limited uses. When they rest and earn their spells or abilities back you can give them back their spent cubes. This helps a new player get out of their character sheet. For as helpful and informative as that sheet is, it’s also a maze of confusion. Getting beginners away from it at will increase their quality of play. In Pathfinder there is an immense amount of conditions, traits, and curses that a player can be afflicted by. The list is already big enough that I need to look up the majority of them when they happen. Imagine being a new player being told that you are sickened, and that means you get a -2 penalty to attack rolls, weapon damage rolls, saving throws, yadda, yadda, yadda. At about the time the “yaddas” are coming, the player immediately doesn’t know what the hell is even happening. Whenever a player is afflicted with a condition, give them the flavour but leave out the numbers. Instead of listing the specifics, tell the player that they are sickened and they don’t feel as strong as they normally do. Then, when a player rolls, keep track of the effect on your end. This gives you, the GM, a bit more work, but it takes the complex conditions out of the mind of the player and lets them get a handle on playing the game. When a giant pit opens up beneath a player you’ll tell them to make a Reflex save. Experienced players know what this means, new players will look at their character sheet and then back at you with their mouths slightly askew in confusion. Instead of asking for the save directly, give them the flavour of what is happening. “You walk into a dungeon, a feeling of dread hangs itself here. You feel something tug on the back of your mind pulling you away from yourself. You try to resist the pull and keep yourself whole. Can you make a Will save?” This allows players to not only understand what is happening, but it gives players the association between what the mind is and how Will save can help. Now, this probably seems quite obvious, but you’d be surprised the amount of games I’ve played where the GM, myself included, would just say “Will save” in the previous situation. What this also does is allow your new players to begin filling in gaps. Soon they’ll learn what means what. When a pit traps opens up they’ll begin asking you in excitement, “Can I move out of the way with a Reflex save?” And you can smile and know that they’re learning and enjoying the game. There are going to be times when a new player comes up with an idea in combat that is either really creative or really helpful. Usually this is accompanied by the new player experiencing a real primal excitement at the game for the first time. If the idea doesn’t make true sense to the rules of the game, that doesn’t mean you should immediately shut down their idea. Instead, spoil them, work with them to figure out how the idea could work. If they want to run up a giant’s back and stab them in the back of the neck, make it work for them within believable context of the game. Likewise, if a new player makes a move in combat that is totally plausible by the rules and could really sway the tide of combat, it’s okay to make that action successful even if their roll wasn’t the best. There’s nothing more demoralizing than having a fantastic idea as a new player and then failing because the dice were against you. As a GM, you can’t do this all the time. When the player is still playing with training wheels, it’s okay to spoil them a bit before they realize the dice hate them. These are just a few methods I’ve incorporated in my current campaign to help my new players. They’ve seen relative success and, at this point, they’ve been comfortable in taking part in both the combat and noncombat encounters. None of these ideas are directly related to teaching the player the game, but rather allow the player to understand the purpose of their character and offer them an easier time getting into that character. Roleplaying games work best when everyone at the table is contributing. No players should be left behind because they don’t feel confident enough to know what they are doing.